patterns of inheritance. Historically, genetic analysis originated as a standard program of breeding experiments, first performed and interpreted in a systematic quantitative manner by the Austrian monk Gregor Mendel, the founder of the science of genetics. In 1865, Mendel's experiments provided the first clear evidence of the discrete units of inheritance that are now called genes, although Mendel himself had no knowledge of genes or the chromosomes on which they are carried. Mendel performed his experiments with the common garden pea, a species that shows well-defined variation in several characteristics, such as flower color, seed color, and seed shape. Mendel followed the inheritance of such characteristics, including flower color, which in peas has two easily distinguished alternative forms, white or purple. In preparation for performing his crosses, Mendel was careful to establish genetically uniform stocks by repeatedly inbreeding or self-fertilizing his stocks for many generations to ensure that all of the plants had flowers of the same color. He also began his analysis by following the inheritance of only one trait at a time. 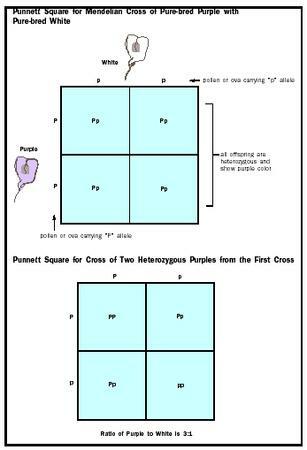 In a typical experiment, he crossed white-flowered with purple-flowered peas and found that all of the progeny from the cross had purple flowers. When these second-generation purple-flowered plants were then self-fertilized, the third generation included both purple- and white-flowered plants in the ratio of one to three. The mathematical regularity and the reproducibility of the pattern of transmission of the trait, and the reappearance of white flower color in the third generation convinced Mendel that the trait of flower color, as well as the other traits he analyzed, were carried by physical particles that were passed along unchanged from one generation to the next. Mendel called these particles unit factors, later renamed genes. Mendel proposed that each adult plant had two genes (factors) for flower color and that each parent randomly passed on only one of its two genes to its offspring during reproduction. For the following discussion, let us use the capital letter P to symbolize the gene for purple flower color and the lowercase letter p to symbolize the gene for white flower color. Such different forms of a particular gene are called alleles . Since Mendel's first-generation plants were true-breeding, the purple-flowered plants had two "purple" alleles (PP), and the white-flowered plants had two "white" alleles (pp). (Each is "homozygous" for the alleles they carry.) If each parent passed one of its alleles to its offspring, all of the second-generation plants would therefore have had one "purple" and one "white" allele (Pp). (These offspring are "heterozygous.") Since all of the second-generation plants had purple flowers, Mendel hypothesized that the "purple" allele masked, or was dominant to, the "white" allele, which he therefore called the "recessive" allele. The phenotype , or outward appearance, of these purple-flowered plants is the same as that produced by PP, even though the genotype, or genetic makeup, is different. When the second-generation, purple-flowered peas (Pp) were allowed to reproduce by self-fertilization, they passed on one of their two alleles for flower color at random in each of the male and female reproductive cells. This means that half of the male reproductive cells (pollen) and of the female reproductive cells (ova) carried a "white" allele and half carried a "purple" allele. The process of this separation and random distribution of one member of each pair of alleles into each reproductive cell is known as Mendel's Law of Segregation. Since fertilization of eggs by sperm occurs randomly, one-quarter of the third-generation progeny inherit two "purple" alleles (PP), one-half inherit one "purple" and one "white" allele (Pp), and one-quarter inherit two "white" alleles (pp). Because of the dominance of the purple allele to the white allele, Mendel observed a three-to-one ratio of purple-flowered to white-flowered progeny. Mendel made another important observation in which he analyzed the simultaneous inheritance of two pairs of alternate alleles, such as purple or white flower color and yellow or green seed color, in the same set of crosses. He found that each pair of alleles was inherited independently. This observation is known as Mendel's Law of Independent Assortment. About fifty years after Mendel performed his experiments with peas, improvements in the microscope led to the discovery of chromosomes and the description of their behavior during meiosis , the type of cell division that occurs during the formation of eggs and sperm. It was observed that the behavior of chromosomes during meiosis was parallel to the behavior of genes as proposed by Mendel. Further work confirmed that allele pairs, such as purple versus white flowers, are carried on homologous chromosomes . Homologous chromosomes are separated during meiosis, accounting for the Law of Segregation. Although Mendel's studies established most of the important general principles of inheritance, some important extensions of his laws have since been discovered. The discovery of chromosomes led to an important exception to Mendel's laws. Mendel assumed that any two pairs of traits would sort independently. However, two traits carried on the same chromosome cannot separate as freely as two traits carried on different chromosomes, thus limiting the Law of Independent Assortment. Traits carried on the same chromosome are said to be linked. If the chromosomal locations (loci) for the two traits are very close together, a particular pair of alleles (for example, purple flowers and thick stems) is likely to remain together. If the loci are far apart, the two alleles may become separated during the crossing over phase of meiosis. In that case, Mendel's assortment law will be more likely to hold. The frequency with which a particular pair of alleles on a chromosome is separated during meiosis can be used to determine their distance apart, and is a first step in mapping chromosomes. The simple Mendelian concepts of dominance and recessiveness have also undergone important refinements and extensions. In many cases, recessiveness is known to be due to a mutation that makes the genes or resulting protein nonfunctional. Presence of one functional allele is often enough to produce adequate levels of protein, and so the functional allele has a dominant effect on the phenotype of the organism. Only when both alleles are defective does the recessive phenotype appear. In some cases, a gene will become mutated to take on a new, harmful function. Such "toxic gain-of-function" mutations are often dominant. In the case of all of the pairs of allelic genes studied by Mendel, one of the two alleles was completely dominant to the other. However, it is more often the case that an organism with two different alleles of a gene will exhibit characteristics that are intermediate between those determined by either allele separately. For example, the progeny of a cross between red-flowered and white-flowered snapdragons have pink flowers. This type of interaction between alleles is called incomplete dominance. In a related phenomenon, co-dominance, both alleles present affect the phenotype. The discovery around 1950 that genes are made of deoxyribonucleic acid (DNA), and the elucidation of the structure of DNA in 1953 by James Watson and Francis Crick, led to a virtual explosion of scientific and technical advances in the analysis and manipulation of the genetic material. Thanks to these developments, Mendelian analysis has been largely replaced by techniques in which the analysis is carried out at the cellular and molecular level. Individual genes can simply be identified, isolated, and copied, and their precise molecular structure and function can usually be determined. An example of this type of analysis is represented in the Human Genome Project, in which the structure of all of the genes in human chromosomes is being elucidated. The origins of all of this sophisticated technology, however, can be traced back to the nineteenth-century pioneering methodical studies on inheritance in peas by Gregor Mendel.